During the weeknight when you want a fresh pot of homemade soup this a rich cauliflower tomato soup recipe which you can prepare in under an hour. Ideally if you have a crock-pot you could simmer this cauliflower tomato soup on low while you are gone to work or running errands. When you come home all you need to do is grab a bowl and spoon and your appetite. I’m always looking for ways to jazz up a tomato soup recipe to add variety especially since our father-in-law provides us with jars of fresh canned tomatoes from his garden. You can certainly taste the difference in a fresh tomato soup recipe when using organic tomatoes however it’s not necessary as I know not everyone has access to organic produce and it can be costly. Alternatively check the reduced rack at the grocery store which is great for tomatoes you can use up quickly or for special deals of the week. For this recipe using a jar of tomato marinara or strained crushed tomatoes also known in Italian as, “Passata Di Pomodoro” which you can find in the International aisle at the grocery store for about $1.00 per/660ml works equally well. One of our favourite brands when we are out of strained tomatoes from the garden is Aurora brand which has been around since 1955. Keep in mind if you are eating low carb that you’ll find 5 grams of sugar in every half of cup of Passata which is natural as tomatoes are naturally sweet. No matter if you use jarred tomatoes or fresh tomatoes sugar is part of the process that occurs naturally. Healthy cauliflower recipes are important in our house since my wife is a low carb foodie who essentially eats limited variety of vegetables. Thankfully the cost of cauliflower has come down from around $7 a head to under $3 which makes it affordable for most people. Recently we were fortunate to find a few heads of cauliflower on the reduced rack for $0.69. We brought them home, washed and grated the cauliflower into cauliflower rice and froze it in portions so we could easily make a cauliflower rice stir-fry or add it to other recipes which is what we did here for this cauliflower tomato soup. What is great about this recipe is that if you have kids or a picky eater who loves tomato soup but doesn’t care for cauliflower they won’t know the difference. The cauliflower is used to thicken up the soup naturally and to add additional nutrients to your soup. The good about Cauliflower: This food is very low in Saturated Fat and Cholesterol. It is also a good source of Protein, Thiamin, Riboflavin, Niacin, Magnesium and Phosphorus, and a very good source of Dietary Fiber, Vitamin C, Vitamin K, Vitamin B6, Folate, Pantothenic Acid, Potassium and Manganese. You will get 5 grams of carbohydrate in each raw cup of cauliflower along with 2 grams of sugar, 2 grams of protein and only 25 calories per serving. 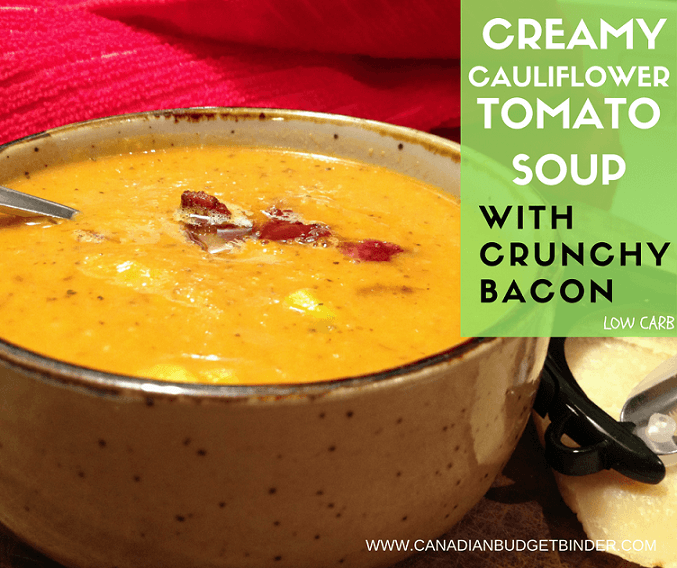 If you eat a low carb high fat diet you know that eating bacon is allowed and why not add some crunchy bacon to the top of this creamy cauliflower soup with shavings of fresh Parmigiano Reggiano cheese? If you watch the prices at Loblaws stores you can pick it up on sale for $3.99lb which is a fabulous price compared to any commercial shaker style cheese which I’d never buy. It’s not worth the money and tastes nothing like the real thing. A bit goes a long way so in fact the price of authentic Parmigiano is worth the money over the long haul. Bacon always pairs nicely with tomato as the salty bacon balances any tomato acidity you might have in your soup. You can do the same when you make a homemade pot of pasta sauce as well. If you read the ingredient label of any pre-made pasta sauce you’ll notice sugar is part of the list for this reason. If you aren’t a fan of the acid in tomatoes especially if they are strained tomatoes or straight from the garden adding a teaspoon of sugar to your soup will take the edge off that tangy flavour. If you want to keep your soup sugar-free then keep it out. The choice is yours. We didn’t add any cheddar cheese or other cheese to the cauliflower tomato soup before we blended it with the hand blender but you could also include this step if you like the cheesy flavour throughout your bowl of soup. Ideally you’d want to use fresh chicken stock that is full of goodness and flavour but not all of us have it canned and waiting to be used up. Whenever we roast a chicken I always keep the bones to make chicken stock and a pot of soup the next day. I tend to make soup right away with any stock we make but you can also can it or freeze it for later use. In the event you do none of the above using Knorr chicken cubes which we like the best for flavour is a frugal route to go. We also go as far to add chicken stock base to our fresh chicken stock to bump up the flavour content which is necessary sometimes. 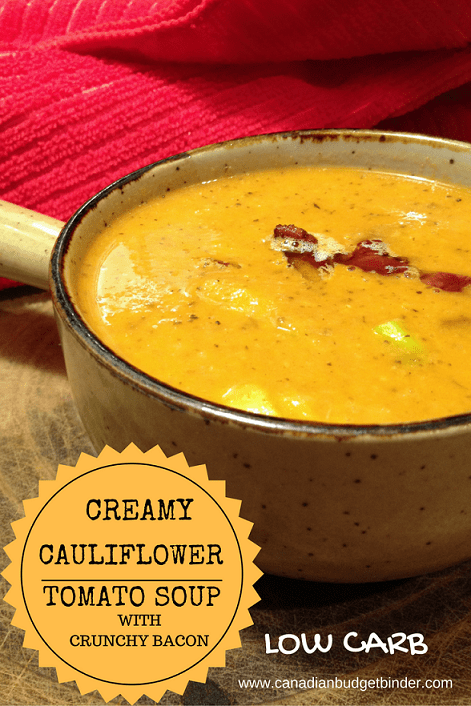 If you want to make this cauliflower tomato soup in the crock-pot simply add all the ingredients as stated in the recipe and simmer on low for 6-8 hours, blend and enjoy. Cauliflower tomato soup is perfect during the winter months when you'd rather be inside instead of out in the cold. Your family will love this soup and they won't even know there is cauliflower hidden away with lots of extra nutrients. In a large soup pot add your butter, garlic and onions and saute until golden. Now you’ll be known as having one of the best tomato soup recipes around but your secret is that it’s not just tomato it’s cauliflower tomato soup! The nutrition above does not include the toppings or added sugar if used. This recipe sounds perfect for those cold winter evenings! Will definitely try it out soon! Yes it’s perfect and a nice change from traditional tomato soup. Let me know what you think when you try it.